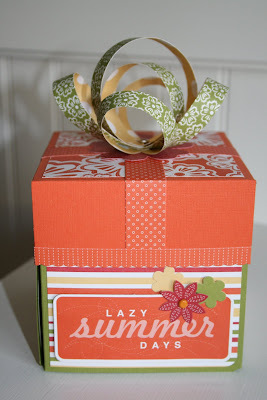 When I held my scrapbox class I borrowed a Simply Scrappin' Summer Days kit from my upline Tami W. In total I must have put together seven boxes. I made one last box to give to Tami, but not from the Summer Days pack. Instead I used the brand new Pina Colada Simply Scrappin' kit to make her box. This worked out perfect because it is the same design yet printed in a new color scheme. I won this kit at convention along with the Calendar Alphabet stamp set. Gifts are always great to receive and even better, to give. I hope she will like her scrapbox. 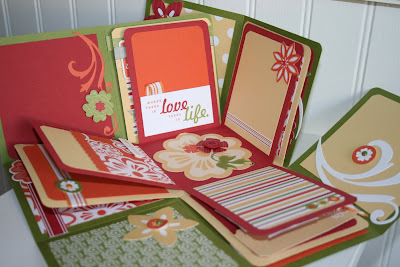 As always, all supplies come from the Stampin' Up! Idea Book and Catalog. I LOVE My box! As I do all samples from Elizabeth. My daughter can't wait to see it. When I told her about it she knows how great Elizabeth's work is and was jealous that I have one! THanks so much - you rock!